Courtesy graphics Bike rack designs approved by the Hailey City Council in June range from whimsical to reminiscent of the old West. 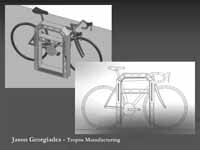 The Hailey City Council approved initial design plans this month for one-of-a kind bike racks that will be installed on Woodside Boulevard next year. Final versions of the racks will be on display in downtown Hailey in July. The racks mark another step in Hailey's ongoing evolution as a bike culture city. New mountain biking trails have been built to the west of town and biking events are increasing. Under the city's "one-percent for art" ordinance, about $45,000 has been set aside within a $4.5 million Woodside Boulevard redevelopment planned for completion by 2012. The Woodside Boulevard Complete Streets Initiative will reconstruct the entire length of Woodside Boulevard from Fox Acres Road to state Highway 75. The redevelopment will include new street surfaces, sidewalks, bike lanes, a Highway 75 traffic light at Woodside Boulevard and a roundabout at Fox Acres Road. It will also include bike racks designed by Blaine County artists Mark Sheehan of Cherry Glow Forge, Jason Georgiades of Tropos Manufacturing and Nate Galpin of Isotope Metal Laboratory. The racks will accommodate at least four bikes each at nine bus stops along Woodside Boulevard. The three artists were chosen from a pool of 15 applicants by a panel selected by Hailey officials. Completed racks will be on display in July downtown at the Hailey Public Library on Main Street, Atkinsons' Market on First Avenue and at the Park & Ride lot on River Street. The first phase of the Woodside redevelopment will begin with a traffic light installation at the intersection of Woodside Boulevard and Highway 75 this fall. The rebuilding of Woodside Boulevard will begin next summer.